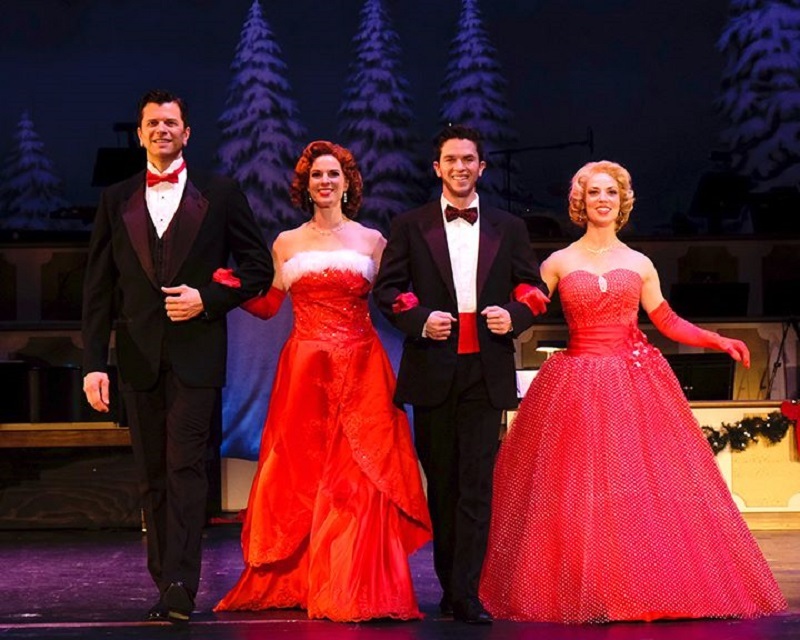 San Diego Musical Theatre brings a WHITE CHRISTMAS to SD! This time of year people look for that holiday classic to help them ring in the holidays, and San Diego Musical Theatre is happy to help with their production of WHITE CHRISTMAS now playing at the North Park Theatre. Playing through Sunday, December 21st, this charming musical is chock full of loved holiday songs like “Happy Holidays”, “I’ve got my Love to keep me Warm”, and it’s namesake “White Christmas. Based on the old movie “Holiday Inn” and then the beloved movie of the same name as the musical, if this show fails to get you into the holiday mood then you weren’t paying attention. The plot follows two Army pals turned entertainers Bob Wallace (Todd Dubail) and Phil Davis (Jeffrey Scott Parsons). While they are successful and about to put up a new show, Phil feels like what Bob really needs is a girl to make his life complete. Phil gets him to check out a sister duo of Betty (Allison Spratt Pearce) and Judy (Tro Shaw), who are related to an old Army buddy, for the new show but they both come away intrigued by the girls. Alas, the girls are on their way to Vermont to perform at and ski lodge, and Phil and Bob follow, albeit without Bob’s real consent. From there Bob and Betty’s unlikely romance starts to take shape and if you want to know the rest of the plot then you should go see the show! This is an old school musical, so there is a lot of dancing, costume changes aplenty, and lots of comic relief. This show keeps the old school charm, even if the plot may at times feel a bit dated to modern sensibilities. This show starts off with a bang with a full cast tap number, and that pretty much sets the tone for the entire show. The numbers by choreographer Lisa Hopkins are fun, energetic, and entirely impressive. The highlight for me was the tap number “I Love the Piano” with Tro Shaw and Jeffrey Scott Parsons, not only is it outstanding, but it may make you want to learn tap and how to play the piano all at once! Dubail and Pearce as Bob and Betty make you believe their initial wariness to each other could blossom into love, but they truly shine in their duets like “Count your Blessings instead of Sheep” and “Love You Didn’t Do Right by Me”. As a fan of the Rosemary Clooney version of the latter song, I can say that this production does not disappoint in the vocals. Shaw and Parsons are adorable as the lighthearted couple and they are a good foil to their more serious couple counterpart. There is a second act surprise with Claire Scheper as Susan, the granddaughter of the guys former General and current innkeeper.. She has the confidence and the flair to make you forget the hilarious version of “Let Me Sing and Be Happy” by Kara J. Franko (as the inns nosey receptionist) from the first act when she sings the reprise of the song. I hope we see more of her in future San Diego productions. So while San Diego may have a few different holiday themed shows playing at the moment, WHITE CHRISTMAS is one that you don’t want to miss! Playing through December 21st at the North Park Theatre, you can get ticket and show time information at www.sdmt.org or call the box office at 858-560-5740.